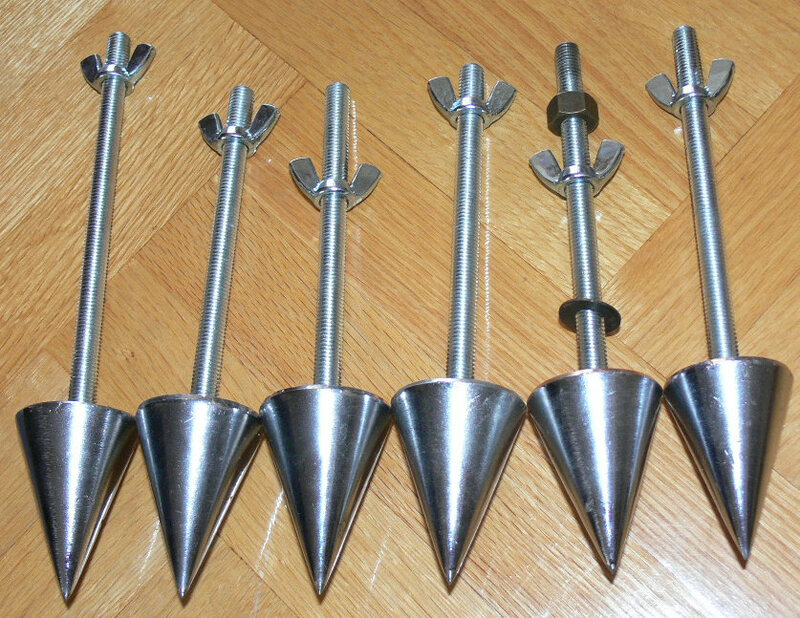 Some time ago I raised your attention to some not-so-ordinary spikes. 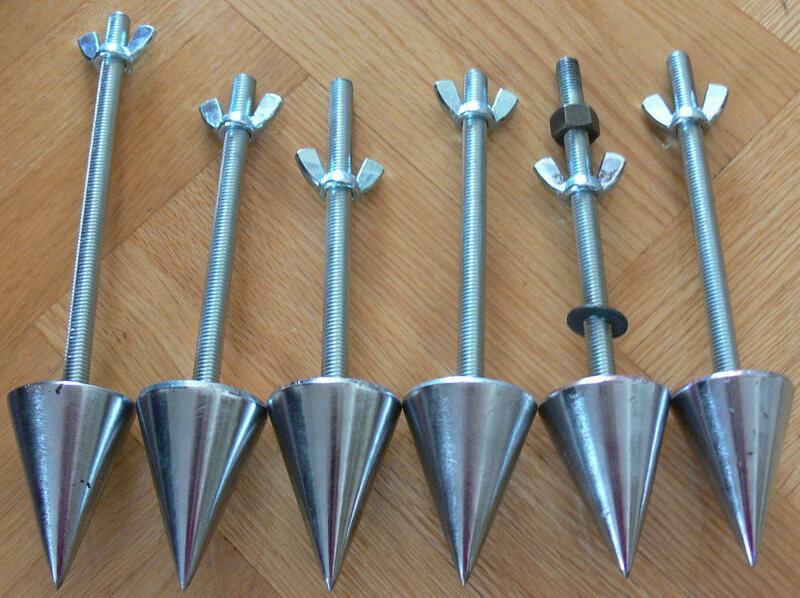 Well, obviously, these were not speaker spikes, as they were purchased in a house and garden supermarket, a house construction materials market, actually. 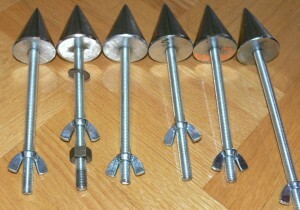 The original “purpose” of these cones is to precisely define the vertical direction, when you are erecting a brick wall. I’m not sure what the exact name of this device is in english, but it has a centrally attached, long string cord. 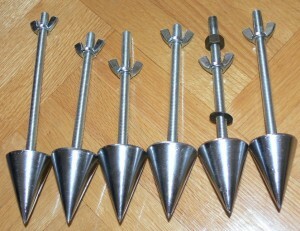 I think that the British English term for the contraption is a “PLUMB”. US-English: “PLUMB-BOB” or “IN PLUMB”. Normally, it comes as a set with a piece of long string, and a specialized M10 screw with central hole, so as to axially connect the string with the cone. Originally, you simply let this “plumb” contraption hang by its string from the top bricks of the masonry wall being currently under construction. The person at ground level overlooks the exact position of the tip of the cone with respect to the foundation and the first layers of brick within the wall. This primitive device gives a good idea about if the wall is vertical or not. Obviously, it works less than optimal if it is a long string and a windy day. In order to make the device fairly immune to gusts of wind, the cone is made of a fairly heavy material. Simply speaking, of iron. Each piece is fairly heavy, weighing approximately 0,3 kg. 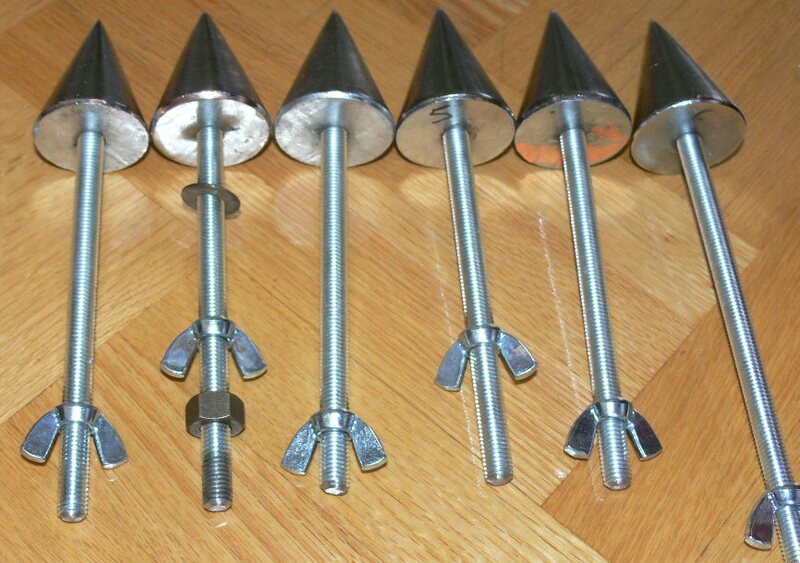 The diameter of the base of the cone is 45 mm. The height of the cone is 70 mm. Obviously, for my “audio” purposes, I got rid of the string, and got rid of the specialized string-mounting screw. For me it was simply crucial to have access to the axial mounting hole. When purchasing the things, I had some doubts as to the raster of the winding of the thread within the central hole (the one where normally the cotton string is attached to). Luckily enough, it turned out that the winding is a fairly normal, a “metric system” M10. For piece of mind, I made the hole slightly deeper, drilled in a slightly deeper hole, and then carved out a slightly longer M10 winding, with a special M10 winding-cutter bit. After all, these things will have to deal with some 110 kg, not always evenly spread. So just to be sure, I deepened the hole and the length of the thread. 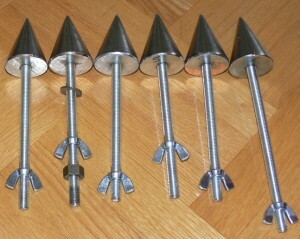 On the pictures you see the cones with pieces of M10 threaded rods, already pre-cut to some reasonable, workable length. 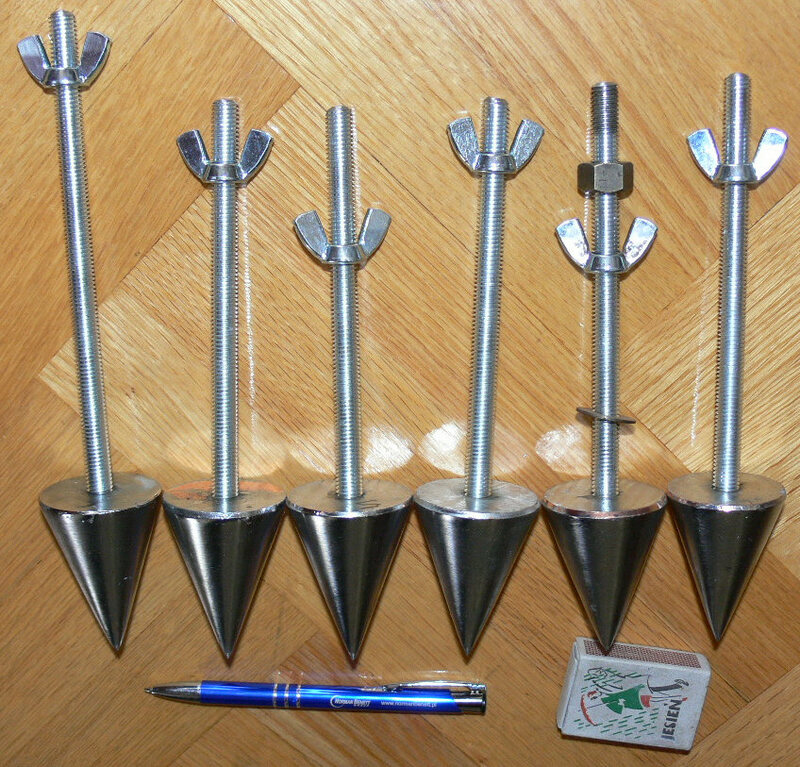 In total I foresee 3 support spikes per each woofer box. Why not four ? The simple answer is that three points of support provide me a guarantee that the speakers will never wobble. Whatever micro unevenness of the floor, they will always be closely coupled to the floor. They shall not wobble. As opposed to four feet, which need to be re-adjusted after each and every relocation of the speaker, a speaker on three spikes will never wobble. Hence, it does not need to be readjusted after being shifted from one location of the room to another. …. or maybe I should make a construction of horizontal profiles protruding from under the woofer box, providing me with a wider spread of these feet, and hence extra stability ? The thing is …. the woofer boxes are fairly narrow. 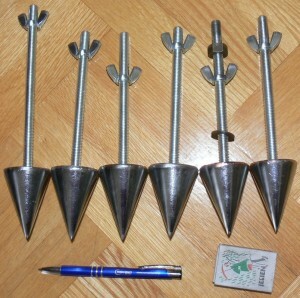 If I drill holes through the base, the spread of the spikes will not be wide enough to provide stability. If somebody would push the speakers from the side, and the “feet” are not set wide apart, the whole speaker set could tilt and fall over. 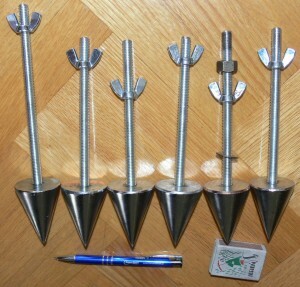 So I think that I shall rather be opting for the option B), that is the horizontal profiles protruding from under the boxes, providing me with a possibility of mounting the spikes fairly wide apart, providing very safe and secure vertical stability of the whole set (so that it does not flip over). 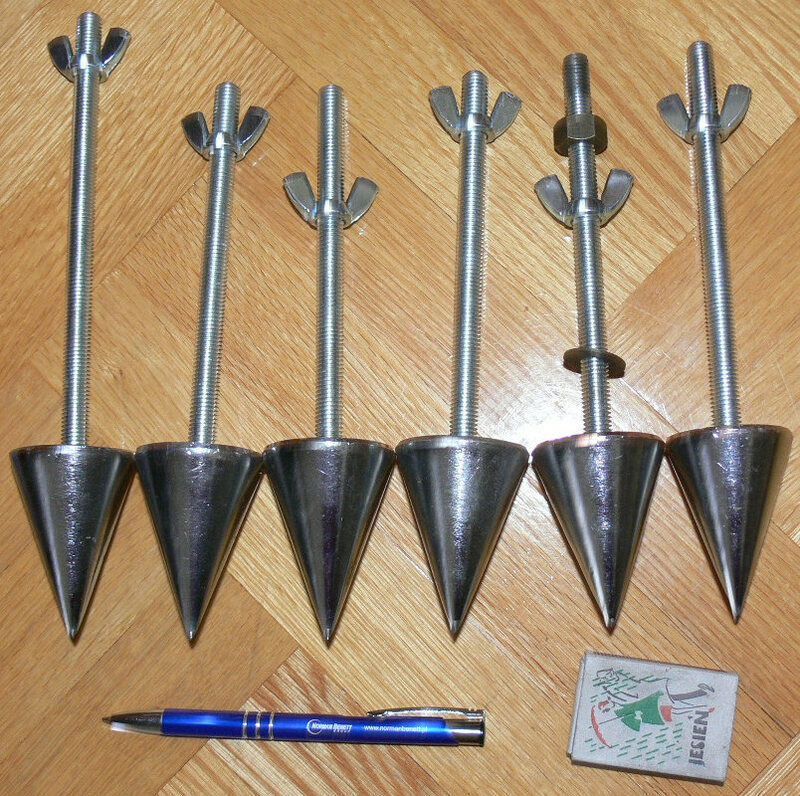 6 x 3 EUR = 18 EUR – For the six plumb cones. 1 x 2 EUR = 2 EUR – For the one meter length of M10 threaded rod. Total expenditure thus far = 20 EUR. 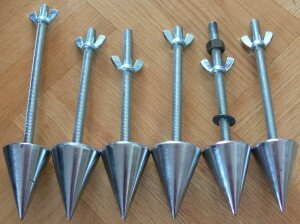 Total weight of these speaker spikes (with threaded rods) = 2 kg. P.S. 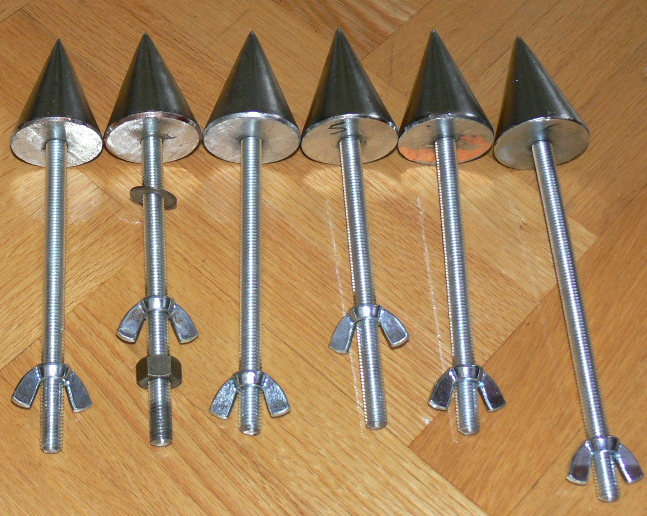 Did I mention, that the cones have a fairly “crude” finish? If you can at all call it a finish ? But worry not. They will be placed close to the ground and under the support profiles, so they will not be easily seen or exposed to the casual eye. And besides, one can always make some corrective touches with sand paper, if it is perceived to be an “issue”. Either way, in comparison to the “traditional” speaker spikes and their prices out there, I firmly believe that this presented solution, in terms of the BANG! for the BUCK, is simply speaking … a killer configuration.